We've updated our Terms & Conditions to introduce Activate Offers. Sign in now to accept. For more than 30 years, AutoZone has been committed to providing the best parts, prices and customer service in the automotive aftermarket industry. With a rich culture and history of going the Extra Mile for customers and the community. Today, AutoZone is the leading retailer and a leading distributor of automotive replacement parts and accessories in the U.S.
Offer valid from 08/01/2013 — 08/01/2019. Offer valid for U.S. and Puerto Rico issued cards at U.S. and Puerto Rico merchant locations. Discount provided as a statement credit on a future account statement. Offer applicable only to purchases of $50 or more made in USD with a valid, enrolled Visa Business card. Offer may be subject to additional terms & conditions. Please see Visa SavingsEdge® Terms & Conditions for more information. © 2019 Visa U.S.A. Inc.
Find the right replacement part for all of your business appliances. From refrigerators, to lawn mowers, to office heating and cooling systems, Sears PartsDirect is your one-stop shop for parts. Use your enrolled Visa Business card on qualifying purchases made at Sears PartsDirect and you’ll save 10%. Offer valid from 08/01/2011 — 08/01/2019. Offer valid for U.S. and Puerto Rico issued cards at U.S. merchant locations only. Applicable taxes must be paid by bearer. Offer applicable only to qualifying purchases made in USD with a valid, enrolled Visa Business card. Discount provided as a credit on a future account statement. Use your enrolled Visa Business card on qualifying fuel purchases made at the pump at participating Texaco retail stations and receive a 2% discount on a future account statement. Offer not valid in Puerto Rico. Offer valid from 09/19/2017 — 07/31/2019. 2% discount applies only to qualifying fuel purchases made at the pump of participating locations with enrolled Visa Business card. Purchases of non-fuel merchandise and gift cards are not included. Offer only valid at participating Texaco retail stations. Offer valid for U.S. issued cards in the U.S. only. Offer may be subject to additional terms and conditions. Please see the Visa SavingsEdge® Terms & Conditions for more information. Offer applicable only on qualifying purchases made in USD with a valid, enrolled, Visa Business card. Use your enrolled Visa Business card on qualifying fuel purchases made at the pump at participating Chevron retail stations and receive a 2% discount on a future account statement. Offer not valid in Puerto Rico. Offer only valid at participating Chevron retail stations. HostGator is a leading provider of Shared, Reseller, VPS, and Dedicated web hosting. With US headquarters in Houston and Austin, TX, HostGator offers a wide variety of subscription plans for all small business customers. Save 5% on purchases made at HostGator with an eligible Visa Business card enrolled in the Visa SavingsEdge Program. Maximum lifetime earn of $150 per enrolled card. Offer valid from 04/18/2017 – 04/12/2019. Offer valid for online and phone purchases only. Offer applicable only to qualifying purchases made with a valid, enrolled Visa Business Card. Maximum lifetime reward earn of $150 per enrolled card. Void where prohibited, taxes, or restricted by law. © 2019 Visa U.S.A Inc. Incorporate a business. Create a custom Employee Handbook. Draft a Lease Agreement, register as an LLC, or form a General Business Partnership! These are just a few of the business-related legal issues that Standard Legal can help you handle without the high-cost of an attorney! Standard Legal offers easy-to-use legal forms software with complete overviews and comprehensive instructions. Not sure you are up to creating legal documents on your own? Let our professionals help you through our Legal Document Preparation Service, another affordable alternative! Standard Legal: affordable solutions for common legal issues. Use your enrolled Visa Business card on qualifying purchases made at Standard Legal and you’ll save 10%. Offer valid from 05/01/2012 — 12/19/2019. Offer may be subject to additional terms & conditions. Please see the Visa SavingsEdge® Terms & Conditions for more information. Stamps.com offers customers a secure Internet mailing solution to print postage using their existing computer, printer and Internet connection without having to go to the Post Office™. Small businesses, home offices and online retailers can now manage their mailing and shipping operations more efficiently and securely than with postage meters or regular stamps. Everyone can enjoy the convenience of online postage and avoid waiting in line at the Post Office. In addition, for businesses, Stamps.com allows for easy tracking and reporting of postage expenditures. Offer valid from 01/03/2017 – 01/02/2020. Save 3% on purchases made at Stamps.com with an eligible Visa Business card enrolled in the Visa SavingsEdge Program. Maximum annual earn of $100 per enrolled card. Maximum annual reward earn of $100 per enrolled card. OfficeFurniture.com provides a large selection of office furniture including computer desks and armoires, chairs, bookcases, file cabinets and more, all at great prices. All products are backed with a 9-year guarantee and are fully stocked and ready for shipping. Use your enrolled Visa Business card on qualifying purchases made at OfficeFurniture.com and you’ll save 5% on all purchases over $250. Offer valid from 09/01/2011 — 06/30/2019. Offer applicable only to qualifying purchases over $250 made with a valid, enrolled Visa Business card. Offer not valid on purchases of gift cards. Offer applicable only to qualifying purchases made in USD with a valid, enrolled, Visa Business card. HyperOffice brings more than ten years of experience helping small to mid-sized businesses skyrocket productivity with cloud based communication, collaboration and mobility software. HyperOffice is a one stop shop for all your team tools – business and mobile email, document and project management, intranet/extranet workspaces, shared calendars and contacts, database apps and web forms accessible on any web connected PC, Mac, mobile device or tablet. Use your enrolled Visa Business card on qualifying purchases made at Visa.HyperOffice.com and you’ll save 12%. Offer valid from 09/01/2011 — 08/31/2019. Built by entrepreneurs for entrepreneurs, since 2003 Grasshopper has been making it easier to grow a small business by providing comprehensive phone management services that let you run your business using your cell phones. Save 5% on your purchases of $50 or more at Grasshopper when paid with your enrolled Visa Business card. Offer valid from 06/01/2015 — 06/01/2019. This offer may not be combined with any other offers, discounts or pricing agreements. Yext.com helps businesses manage the public facts and business information that they want consumers to know across the digital ecosystem. The Yext Knowledge Engine™ lets companies manage their digital knowledge in the cloud and sync it to over 100 services in the PowerListings® Network. Yext Listings, Pages, and Reviews help businesses around the globe facilitate face-to-face interactions that boost brand awareness, drive foot traffic, and increase sales. Save 4% on purchases made at Yext.com with an eligible Visa Business card enrolled in the Visa SavingsEdge Program. Maximum lifetime earn of $100 per enrolled card. Offer valid from 11/21/2017 – 11/20/2019. Maximum lifetime reward earn of $100 per enrolled card. Search engine advertising provides an efficient and effective way to reach your target audience. Save 5% on your search engine advertising campaign on Bing Ads if you’re enrolled in the Visa SavingsEdge program. (See offer details below). With search advertising you can: Increase leads, sales, and awareness of your business. Target the right audience—locally or nationwide. Control your advertising budget and spending at all times. Offer valid from 11/01/2013 — 06/30/2019. Receive 5% savings on your Bing Ads campaigns when paid with an eligible Visa Business card enrolled in the Visa SavingsEdge® Program up to a maximum of $500 for the term. Visa Business card must be enrolled in the Visa SavingsEdge program. Void where prohibited, taxed or restricted by law. Taxes, if any, are the sole responsibility of the recipient. Savings provided as a credit on Visa account statement. Register.com provides the essential tools that businesses need to build and manage their online presence. With over 15 years in the industry, 50 products, 2 million domain names under management, and hundreds of thousands of satisfied customers, Register.com is a leader in online small business tools. Save 4% on purchases made at Register.com with an eligible Visa Business card enrolled in the Visa SavingsEdge Program. Maximum lifetime earn of $100 per enrolled card. Offer valid from 04/18/2017 – 04/18/2019. Davinci Virtual Office Solutions allows small to mid-size businesses to level the playing field. Davinci Virtual Office Solutions is the global service provider of prime business addresses, friendly live receptionist services and fully equipped meeting spaces. Use your enrolled Visa Business card on qualifying purchases made at Davincivirtual.com and you’ll save 5%. Offer valid from 10/25/2011 — 10/15/2019. Offer may be subject to additional terms and conditions. Please see the Visa SavingsEdge® Terms & Conditions and the Davinci Virtual Terms and Conditions for more information. Umbra has grown to become the world leader of modern, original, casual and affordable design for the home and office, introducing designs that have broken the mold and creating entirely new categories in the decor and gifting market. Offer valid from 10/07/2013 — 04/01/2019. Gabbyville is a team of knowledgeable, friendly virtual receptionists in Knoxville, TN. who are available during your business hours to respond to your client calls. They not only take messages, they schedule appointments, make reminder calls, handle gift certificate orders and many other responsibilities. Gabbyville is there for your customers when you can’t be. That means you never miss a business opportunity because you couldn’t get to the phone. Use your enrolled Visa Business card on qualifying Gabbyville live receptionist service and you’ll save 5% on all purchases. Offer valid from 06/15/2014 — 06/01/2019. Offer valid on charges appearing on the bill when paid with an enrolled Visa Business card. Offer may be subjected to additional terms and conditions. Please see the Visa SavingsEdge® Terms & Conditions for more information. More than 10 million people and businesses around the world use MailChimp. Our features and integrations allow you to send marketing emails, automated messages, and targeted campaigns. And our detailed reports help you keep improving over time. MailChimp has been around since 2001. The company started as a side project funded by various web-development jobs. Now we’re the world’s leading email marketing platform, and we send more than a billion emails a day. We democratize technology for small businesses, creating innovative products that empower our customers to grow. 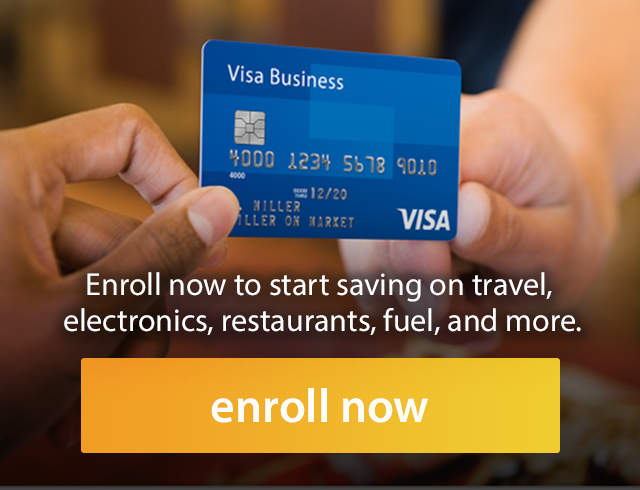 Use your enrolled Visa Business card today on purchases at MailChimp and you'll save 5%. Maximum lifetime reward earn of $200 per enrolled card. Offer valid from 10/18/2016 – 01/17/2020. Maximum lifetime reward earn of $200 per enrolled card. You're about to join thousands of businesses that have discovered how to make their shipping faster, easier and cheaper through uShip. Fact is, we tackle transportation a little differently than the rest. Our marketplace lets service providers compete for your business based on price and service record. We then add our own technology to help eliminate the logistical guesswork, no matter what you ship. From booking to communications to payment, uShip helps you transport freight faster, cheaper, safer, and easier so you can stay focused on your business. Save 5% on purchases made at uShip with an eligible Visa Business card enrolled in the Visa SavingsEdge Program. Maximum lifetime earn of $200 per enrolled card. Offer valid from 12/27/2016 – 12/26/2019. At Zazzle, The Make Engine™, we believe that imaginations should be indulged. Curiosities, expressed. Inner designers, unleashed. Zazzle is the world's leading quality custom products platform. Launched in 2005, our vision is to redefine commerce and give consumers the power to make anything imaginable. Consumers can upload images and create their own merchandise (clothing, posters, etc. ), or buy merchandise created by other users, as well as use images from participating companies. With an ever expanding array of categories we have the customized merchandise solution for you. Save 5% on your purchases at Zazzle when paid with an eligible Visa Business card enrolled in the Visa SavingsEdge Program. Coffee is an essential part of life in a small business. CoffeeforLess.com offers a wide variety of different flavors available in multiple forms including - Keurig K-Cups, ground coffee, and whole beans. CoffeeforLess.com doesn’t only specialize in coffee; they also offer tea, hot chocolate, energy drinks, and much more. Use your enrolled Visa Business card on qualifying purchases made at CoffeeforLess.com and you’ll save 5%. Offer not valid in Puerto Rico. Business Giving…Inspired by Godiva. For 85 years, Godiva has delivered an exceptional array of gifts for business clients that reflect their commitment to quality and good taste and make a lasting impression on all who receive it. Today’s the day to show your appreciation to valued employees and clients who have contributed to your company’s success. Use your enrolled Visa Business card on qualifying purchases made at Godiva® Chocolatier and save 8% and receive personalized service with your order. Offer only valid through, Godiva VIP Gift Services, Godiva.com and participating Godiva Chocolatier retail stores. Building relationships and connecting with clients shouldn’t put your expense budget in the red. FromYouFlowers.com in partnership with Visa SavingsEdge® is committed to helping you grow your business so you'll save 8% off the total net purchase for every purchase you make at FromYouFlowers.com, no minimums and no limits! Offer valid from 11/11/2010 — 03/01/2019. Red Robin has been serving quality food since 1969 in over 450 restaurants across the U.S. Menu items include burgers, chicken sandwiches, salads, entrees, and more. Use your enrolled Visa Business card on qualifying purchases made at Red Robin and you’ll save 1% on all purchases over $40. Offer not valid in Puerto Rico. Offer valid from 08/01/2011 — 12/31/2019. Offer applicable only to qualifying purchases over $40 made with a valid, enrolled Visa Business card. Founded in 1983, Panda Express is America’s favorite Chinese restaurant. With more than 1,800 stores globally, Panda Express is American’s largest family-owned Chinese restaurant. From our world-famous orange chicken to our health-minded wok smart™ selections, Panda Express defines American Chinese Cuisine. Save 2% on a purchase of $20 or more with Panda Express when paid with a valid, enrolled Visa Business card. Offer valid from 07/05/2016 – 07/06/2019. Offer applicable to in-store purchases only. Information is today’s new currency. To succeed in today’s economy, you need access to reliable and timely information. The Wall Street Journal’s unrivaled news coverage and unbiased reporting provide the expert insight and guidance to help with your business and the business of life. Use your enrolled Visa Business card to purchase a subscription to The Wall Street Journal (in both print and digital) for only $25.99 for the first 3 months. You’ll save 67% and receive a $3 statement credit on a future account statement. Offer valid from 12/06/2012 — 12/06/2019. At the end of the introductory period, service will continue automatically at our regular rate unless you cancel your subscription. After this introductory period, your credit card will be charged $25.99 monthly. $3 statement credit is only applied to the first transaction after enrollment. As one of the world’s largest pizza delivery companies Papa John’s delivers on their promise of Better Ingredients and Better Pizza. For 14 of the past 16 years, consumers have rated Papa John's No. 1 in customer satisfaction among all national pizza chains in the American Customer Satisfaction Index (ACSI). For you, it’s not just a better pizza. It’s a family gathering, memorable birthday, work celebration or simply a great meal. It’s our goal to make sure you always have the best ingredients for every moment. Use your enrolled Visa Business card today on purchases at Papa John’s and you’ll save 2% on purchases of $30 or more. Offer valid from 09/01/2015 — 08/31/2019. Corner Bakery Cafe provides a menu of ingredient-inspired, prepared-to-order food. When you visit Corner Bakery cafe, you'll see real kitchens in place of assembly lines. You'll hear the chopping of over 40 types of fresh herbs, fruits and vegetables, and the sizzle of a real panini grill. You'll see the stove's open flame and feel the warmth from ovens working all day long. They are traditions established years ago and still passionately followed today. Save 2% on purchases of $25 or more made at Corner Bakery Cafe with an eligible and enrolled Visa Business card. Maximum annual earn of $100 per enrolled card. Offer valid from 10/17/2017 – 10/16/2019. Offer valid for in store, online and phone purchases only. Panera Bread focuses on delivering food and a customer experience as it should be. Food should taste good. It should feel good. And it should do good things for you and the world around you. That's Panera Bread. Panera Bread can now be found in 46 states at over 1,600 US locations. Save 2% on your in-store purchases only, with Panera Bread when paid with an eligible Visa Business card enrolled in the Visa SavingsEdge® Program ("Program"). Maximum annual earn of $250 per card. Offer not valid in Puerto Rico. Offer valid from 11/10/2015 — 10/31/2019. This offer is valid only on in-store purchases and may not be combined with any other offers, discounts or pricing agreements. Offer applicable only to qualifying purchases made in USD with a valid, enrolled, U.S.-issued Visa Business card. Maximum annual earn of $250 per enrolled card. Boost Mobile offers customers big savings, simple payment options and no long-term commitments with their monthly unlimited plans starting at just $35/mo. There are no annual contracts, no credit checks, no overage fees and no roaming charges. Boost Mobile operates service on the Nationwide Sprint® Network. Which delivers a dependable network with no roaming charges, competitive speeds, and fewer dropped calls. Save 3% on your purchases with Boost Mobile when paid with your enrolled Visa Business card. Maximum annual earn of $100 per card. Offer valid from 01/12/2016 – 01/11/2020. Maximum annual earn of $100 per enrolled card. Offer applies only to transactions made directly with Boost and does not apply to transactions for Boost's goods or services sold through another retailer or other third party. Save 4% on your purchases at Aria when paid with an eligible Visa business card enrolled in the Visa SavingsEdge Program. Maximum annual discount of $100 total per card across participating MGM properties, which include MGM Grand, The Mirage, Monte Carlo, Luxor, Mandalay Bay, Aria, Excalibur, Circus Circus. MGM Resorts International develops, builds and operates unique destination resorts designed to provide a total resort experience, including first-class accommodations and dining, world-class entertainment, state-of-the-art meeting and convention facilities, and high-quality retail and gaming experiences. Offer valid from 05/17/2016 – 05/16/2019. Maximum annual discount of $100 total across selected properties – includes MGM Grand, The Mirage, Monte Carlo, Luxor, Mandalay Bay, Aria, Excalibur, Circus Circus. Experience our hometown hospitality, complete with free continental breakfast, complimentary high-speed internet and comfortable rooms at the right price. You’re never far from home at Baymont Inn & Suites®. Use your enrolled Visa Business card on qualifying hotel room reservations made at Baymont Inn & Suites® and you'll save 4%. Offer not valid in Puerto Rico. Offer Valid from 05/14/2018 – 05/31/2019. Offer valid for in store, online, and phone purchases. Offer may be subject to additional terms and conditions. Please see the Visa SavingsEdge Terms and Conditions for more information. Void where prohibited, taxed, or restricted by law. With large, spacious rooms and amenities you’ll love, Hawthorn is the perfect place to spend an extended stay. Whether on the road for work or traveling on vacation, you’ll enjoy more ways to stay connected, productive and comfortable at Hawthorn. Use your enrolled Visa Business card on qualifying hotel room reservations made at Hawthorn Suites by Wyndham and you’ll save 4%. Offer not valid in Puerto Rico. With over 1,700 locations worldwide, Days Inn® hotels offer great value to leisure and business travelers including free Daybreak® Breakfast and free high-speed Internet access. We work hard to earn our reputation as "The Best Value Under the Sun." 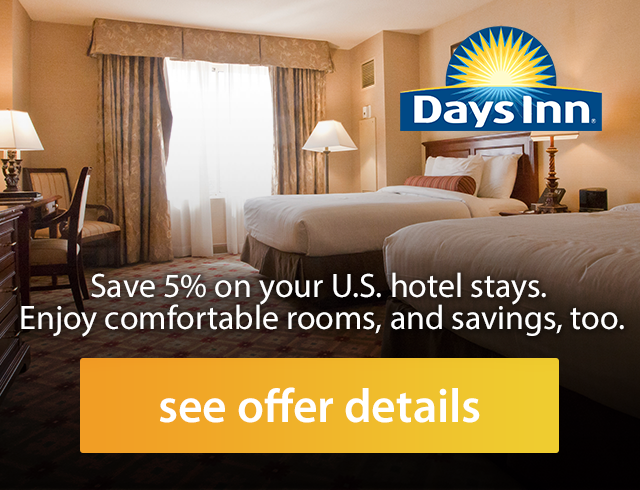 Use your enrolled Visa Business card on qualifying hotel room reservations made at Days Inn® and you’ll save 4%. Offer not valid in Puerto Rico. Come visit Wyndham Garden and enjoy contemporary amenities with an upscale twist. Use your enrolled Visa Business card on qualifying hotel room reservations made at Wyndham Garden and you’ll save 4%. The GO Group provides airport shuttles to and from airports across the United States. Use your enrolled Visa Business card on qualifying purchases made at GO Shuttle and you’ll save 10%. Offer valid from 05/31/2012 — 10/17/2019. Discount applies only to reservations booked online at www.goairportshuttle.com. Book now and save 5% on your next stay at La Quinta Inns & Suites™ locations in the United States when you make a qualifying purchase with your enrolled Visa Business card at more than 850 hotels. In addition to the savings, your travel dollars go further with free extras and amenities including: FREE Bright Side Breakfast®, comfy pillowtop beds, and FREE Wi-Fi, now upgraded to be five-times faster than before. To redeem this offer, call 1-800-SLEEPLQ (753-3757) or book online. To redeem this offer, click the link below or call 1-800-SLEEPLQ (753-3757). Offer valid from 01/15/2018 - 12/31/2019. LA QUINTA is registered in the U.S. Patent and Trademark Office. For value-conscious travelers looking for familiar, dependable lodging Knights Inn® offers road travelers on a budget easily accessible and basic overnight accommodations. Use your enrolled Visa Business card on qualifying hotel room reservations made at Knights Inn and you’ll save 4%. Offer not valid in Puerto Rico. Each Wyndham Grand hotel and resort is a one-of-a-kind experience with a compelling local flavor. Here you will find attentive service, relaxing surroundings and thoughtful touches you expect from Wyndham on a grand scale. Use your enrolled Visa Business card on qualifying hotel room reservations made at Wyndham and you’ll save 4%. Save 4% on your purchases at Excalibur when paid with an eligible Visa business card enrolled in the Visa SavingsEdge Program. Maximum annual discount of $100 total per card across participating MGM properties, which include MGM Grand, The Mirage, Monte Carlo, Luxor, Mandalay Bay, Aria, Excalibur, Circus Circus. MGM Resorts International develops, builds and operates unique destination resorts designed to provide a total resort experience, including first-class accommodations and dining, world-class entertainment, state-of-the-art meeting and convention facilities, and high-quality retail and gaming experiences. Focusing on providing comfortable accommodations and friendly service, an ideal option for all budget minded travelers. Use your enrolled Visa Business card on qualifying hotel room reservations made at Travelodge and you’ll save 4%. Offer not valid in Puerto Rico. Save 4% on your purchases at Luxor when paid with an eligible Visa business card enrolled in the Visa SavingsEdge Program. Maximum annual discount of $100 total per card across participating MGM properties, which include MGM Grand, The Mirage, Monte Carlo, Luxor, Mandalay Bay, Aria, Excalibur, Circus Circus. MGM Resorts International develops, builds and operates unique destination resorts designed to provide a total resort experience, including first-class accommodations and dining, world-class entertainment, state-of-the-art meeting and convention facilities, and high-quality retail and gaming experiences. For value-conscious travelers looking for familiar, dependable accommodations and amenities that ensure a happy stay. Use your enrolled Visa Business card on qualifying hotel room reservations made at Howard Johnson and you’ll save 4%. Save 4% on your purchases at Mandalay Bay when paid with an eligible Visa business card enrolled in the Visa SavingsEdge Program. Maximum annual discount of $100 total per card across participating MGM properties, which include MGM Grand, The Mirage, Monte Carlo, Luxor, Mandalay Bay, Aria, Excalibur, Circus Circus. MGM Resorts International develops, builds and operates unique destination resorts designed to provide a total resort experience, including first-class accommodations and dining, world-class entertainment, state-of-the-art meeting and convention facilities, and high-quality retail and gaming experiences. Offer valid from 05/14/2018 — 05/31/2019. Wingate by Wyndham® offers business travelers all the tools and amenities to work comfortably from the road for one simple price – a free hot breakfast, high-speed internet access, printing, copying and faxing in the 24-hour business center, access to the fitness center and whirlpool are always included. Use your enrolled Visa Business card on qualifying hotel room reservations made at Wingate by Wyndham and you’ll save 4%. Offer not valid in Puerto Rico. Having been ranked “Highest in Guest Satisfaction among Economy/Budget Hotel Chains, Ten Years in a Row” by J.D. Power and Associates, this award-recognized chain of all newly constructed hotels delivers consistently high guest satisfaction, free high speed internet, continental breakfast and more, at affordable rates. Microtel, a better play to stay. Use your enrolled Visa Business card on qualifying hotel room reservations made at Microtel Inns and you’ll save 4%. Offer not valid in Puerto Rico. Wyndham Hotels and Resorts is an upscale, full-service brand. It offers the comfort and amenities you would expect in a world-class hotel, including beautifully appointed public areas, thoughtfully detailed guest rooms and distinct dining options. Business locations feature meeting space flexible for large and small meetings, as well as business centers and fitness centers. Many resorts offer golf, tennis, beautiful beaches, spas and more.Use your enrolled Visa Business card on qualifying hotel room reservations made at Wyndham Hotels and Resorts and you’ll save 4%. Offer not valid in Puerto Rico. Get a guaranteed, reserved parking spot near hundreds of top destinations across the U.S. using ParkWhiz including airports, stadiums and theaters. Use your enrolled Visa Business card on qualifying purchases made at ParkWhiz.com and you'll save 5%. Offer not valid in Puerto Rico. Offer valid from 10/25/2011 — 03/13/2020. Save 4% on hotel room reservations in the U.S.
With free high speed internet, comfy beds, and nearly 400 locations in the U.S., Ramada offers a variety of hotel choices to match every trip. You do your thing, leave the rest to us®! Use your enrolled Visa Business card on qualifying hotel room reservations made at Ramada Worldwide locations in the U.S. and you’ll save 4%. Offer not valid in Puerto Rico. Save 4% on your purchases at Monte Carlo when paid with an eligible Visa business card enrolled in the Visa SavingsEdge Program. Maximum annual discount of $100 total per card across participating MGM properties, which include MGM Grand, The Mirage, Monte Carlo, Luxor, Mandalay Bay, Aria, Excalibur, Circus Circus. MGM Resorts International develops, builds and operates unique destination resorts designed to provide a total resort experience, including first-class accommodations and dining, world-class entertainment, state-of-the-art meeting and convention facilities, and high-quality retail and gaming experiences. Save 4% on your purchases at The Mirage when paid with an eligible Visa business card enrolled in the Visa SavingsEdge Program. Maximum annual discount of $100 total per card across participating MGM properties, which include MGM Grand, The Mirage, Monte Carlo, Luxor, Mandalay Bay, Aria, Excalibur, Circus Circus. MGM Resorts International develops, builds and operates unique destination resorts designed to provide a total resort experience, including first-class accommodations and dining, world-class entertainment, state-of-the-art meeting and convention facilities, and high-quality retail and gaming experiences. Save 4% on your purchases at Circus Circus when paid with an eligible Visa business card enrolled in the Visa SavingsEdge Program. Maximum annual discount of $100 total per card across participating MGM properties, which include MGM Grand, The Mirage, Monte Carlo, Luxor, Mandalay Bay, Aria, Excalibur, Circus Circus. MGM Resorts International develops, builds and operates unique destination resorts designed to provide a total resort experience, including first-class accommodations and dining, world-class entertainment, state-of-the-art meeting and convention facilities, and high-quality retail and gaming experiences. Save 4% on your purchases at MGM Grand when paid with an eligible Visa business card enrolled in the Visa SavingsEdge Program. Maximum annual discount of $100 total per card across participating MGM properties, which include MGM Grand, The Mirage, Monte Carlo, Luxor, Mandalay Bay, Aria, Excalibur, Circus Circus. MGM Resorts International develops, builds and operates unique destination resorts designed to provide a total resort experience, including first-class accommodations and dining, world-class entertainment, state-of-the-art meeting and convention facilities, and high-quality retail and gaming experiences. With over 2,000 convenient locations across North America offering free breakfast and free high speed internet access, you can always count on Super 8® for a great night's rest. Use your enrolled Visa Business card on qualifying hotel room reservations made at Super 8® and you’ll save 4%. Offer not valid in Puerto Rico. © Copyright 2008-2019 Visa. All Rights Reserved.